1. 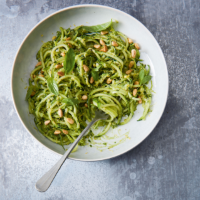 Place the avocado flesh, almost all the lemon zest, the lemon juice, all but a few basil leaves – along with the thinner stalks – garlic, pine nuts and olive oil into a food processor. Season. Pulse to make a rough pesto. 2. Cook the courgette spaghetti according to the pack instructions, then drain off the water. Toss with a quarter of the pesto. Serve immediately with plenty of black pepper, the reserved lemon zest, basil leaves and extra pine nuts to garnish. 3. Cover the remaining pesto with clingfilm, pushing it directly against the surface – it will keep in the fridge for 2 days. Delicious in place of butter or mayo in sandwiches and as a dressing for salads.